Start with In The Garden - build an insect hotel for creepy crawlies, make fairy posies and create a wheelbarrow vegetable garden. Growing Fun has projects for plants that can be grown in small spaces, from growing a cress caterpillar in an old egg box on the windowsill to transforming your old rain boots into containers for tulips and daffodils. The Outdoors Indoors includes craft ideas for things you've collected - butterfly shell magnets, pine cone animals and an autumn leaf picture frame. 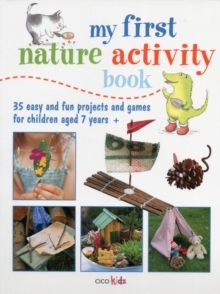 Finally, head to Outdoor Crafts and Games with activities for camping, from a secret trail and a wigwam for your teddies, and for the beach, such as playing pebble games and creating seaweed creatures. Every project has a skill level of 1, 2, or 3, and comes with easy-to-read instructions and adorable, step-by-step artworks that will guide you along the way.